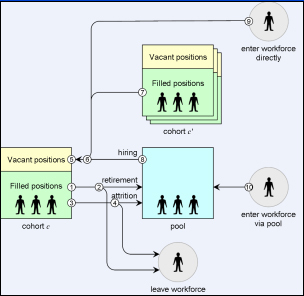 UAH/ITSC developed a detailed computer model of the Huntsville technical workforce to analyze the effects of the scheduled BRAC (base realignment and closure) relocations and to experiment with approaches to meeting Huntsville employers' personnel requirements. Due to Base Realignment and Closure (BRAC) actions, approximately 4,500 government positions and 15,000 contractor positions, concentrated in technical, logistical, and acquisition fields, will be moving to Huntsville Alabama over a five year period. Because of retirements, transfers, and job changes, not all of the people filling those positions will transfer to Huntsville. This raises a number of pertinent questions. What effect will the transferred positions and vacancies have on the Huntsville technical workforce? Will there be any impact resulting from persons moving between jobs to take advantage of promotional opportunities? Will vacancies in some organizations or career specialties be more or less easily filled? What recruiting, hiring, and educational responses will work best to supply needed personnel? The University of Alabama in Huntsville developed a computer model of the Huntsville workforce to investigate these questions. The model simulates the status and progression of the Huntsville technical workforce over a 5 year period (2007-2011 inclusive). Representation is at the level of individual persons (persons are tracked anonymously), positions, and vacancies. The model's underlying structure is discrete-event (events, such as retirements, occur at discrete instants in time) and time-stepped (time advances in fixed increments). Events modeled include hirings, retirements, attritions, graduations, and promotions. These events occur in accordance with applicable personnel rules, e.g., determination in the model of retirement eligibility for a government employee is based on the rules of the applicable government retirement program. The probabilities of stochastic events in the model, such as whether a person eligible to retire actually does so, have been calculated from historical data for those personnel actions.